This document is the first regional land use plan for the Territorial Sea of Kymenlaakso Region. It is a first attempt at integrated spatial planning of the sea area. What are the new MSP-related land use designations? How does regional planning in Finland cover territorial waters adjacent to the Finnish countries? In Autumn 2013, the first regional land use plan for the Territorial Sea of Kymenlaakso Region was drafted and approved by the Regional Council of Kymenlaakso and ratified by the Ministry of the Environment. The regional plan was prior to the adoption of the EU MSP directive and therefore does not follow the common framework. Furthermore it does not for example cover EEZ, but is a first attempt at integrated spatial planning of the sea area. The plan area covers the Kymenlaakso Region which is located about 120km east of Helsinki and shares a common border with Russia. A total area of 1822 sq km of Territorial Sea is included in the plan, covering ca. 25 % of the total surface area of the region. The plan does not cover the EEZ as the Land Use and Building Act is not currently applicable to the EEZ. The plan aims to strengthen the region’s marine area’s nature, cultural heritage, natural and ecosystem resources use as well as the shipping, military and tourism sectors. Known environmental risks such as eutrophication, seafaring accidents and sedimentary pollution have been recognized. The plan also aims to address issues concerning the Marine Strategy and Water Framework Directives, Maritime Spatial Planning Directive and ecosystem based planning goals of the European Union. The plan is of a comprehensive nature. It is a strategic plan which underlines spatial priorities and reserve space for the implementation. Thus it also contains general subareas not regulated by the plan. The plan includes a graphic and a text part (commentary). One of the particularities of this plan is that a broad public participation was held throughout the planning process. Several workshops were held with relevant national and local stakeholders. A total of twelve public hearings took place in the six municipalities of the region. 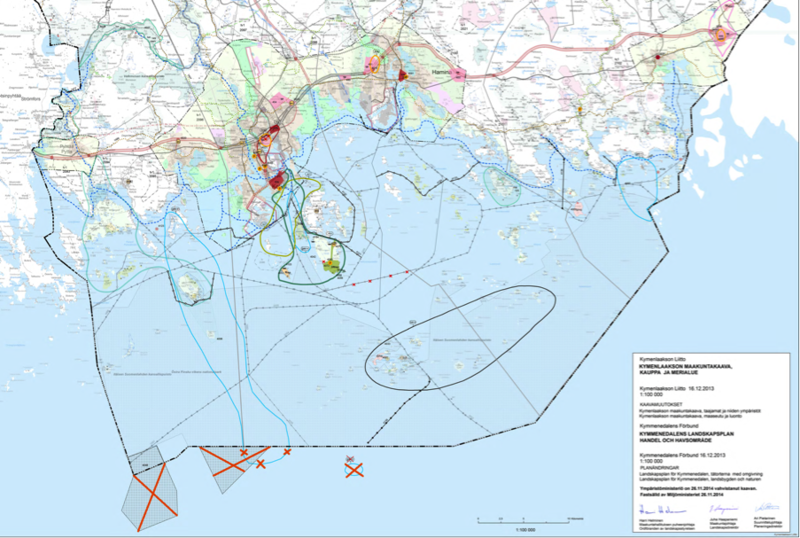 As far as the sea space is concerned, the regional plan addresses, among others, the following land uses: ports and harbours, military areas, nature protection areas, landscape protection areas, sites for wind energy production, different types of recreation and tourist areas, and development zones. Besides, the Regional Plan of Kymenlaakso contains designated areas for aquaculture and planning orders related to migrating fish stocks. Planning orders covering the whole region also take into account flooding risks connected to climate change. Power lines, telecommunication cables, water pipelines as well as filling areas for shipping route maintenance have been shown in detail in the commentary to the plan, but not on the map. In the Regional Plan of Kymenlaakso some completely new MSP-related land use designations have been agreed on: large areas of significant underwater biodiversity and areas of significant underwater geological diversity as well as submarine cultural heritage sites are shown on the map. The said areas were accompanied by planning orders. New Natura 2000 sites located in the EEZ were also including in the planning processes.